Host Russell Brand plots to draw attention to notorious party boy Charlie Sheen if he botches his performance at the 2012 MTV Movie Awards. 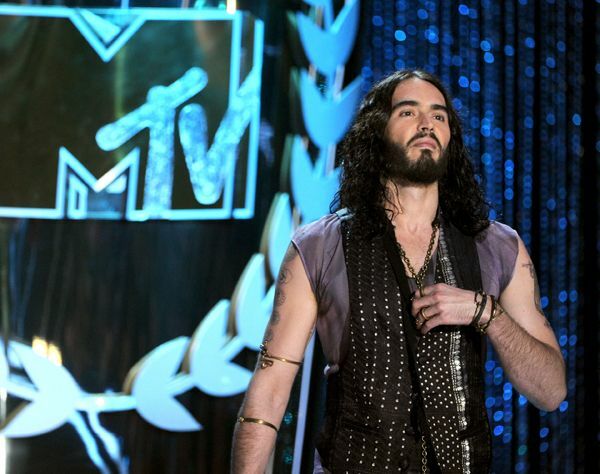 Charlie Sheen plays along with Russell Brand when the host says he's stashed booze and drugs under the actor's seat at the 2012 MTV Movie Awards. 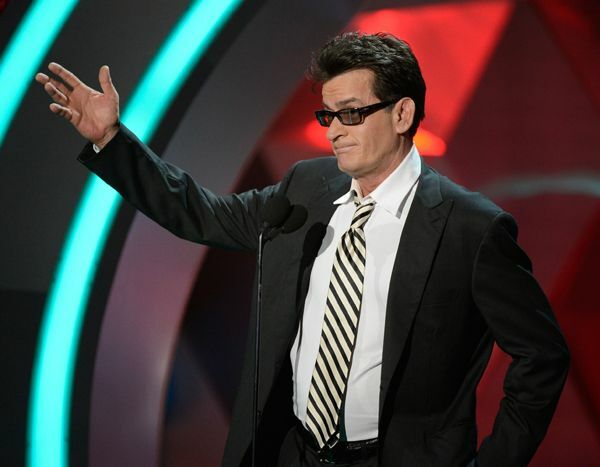 Charlie Sheen introduces a montage of party scenes before Wiz Khalifa performs a party of his own at the 2012 MTV Movie Awards. 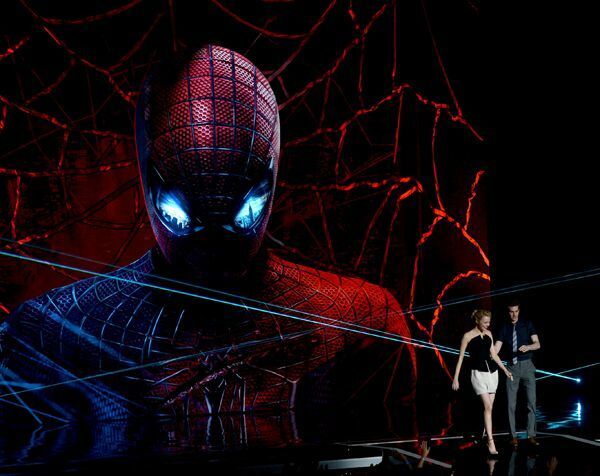 Presenters Emma Stone and Andrew Garfield, stars of 'The Amazing Spiderman,' dodge the laser spider webs at the 2012 MTV Movie Awards. 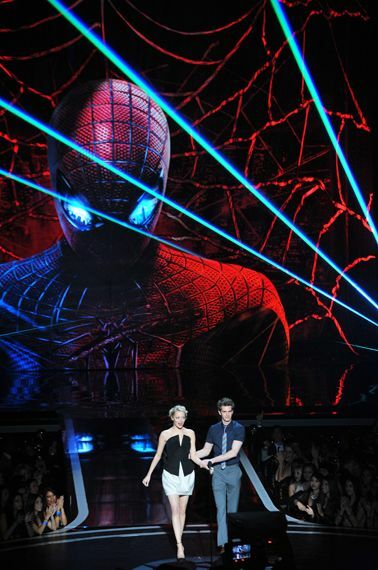 Emma Stone and Andrew Garfield, stars of 'The Amazing Spiderman,' make a dramatic entrance to present Breakthrough Performance at the 2012 MTV Movie Awards. 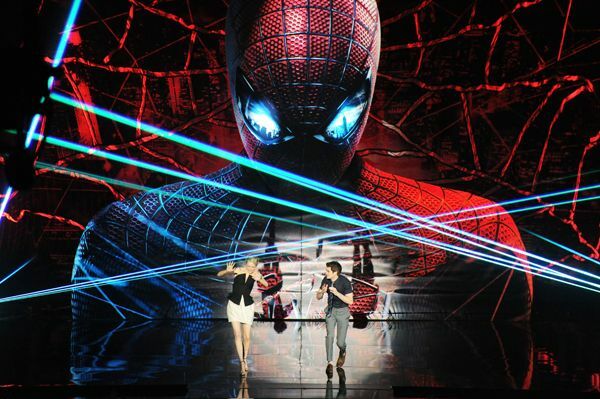 Emma Stone and Andrew Garfield are given an entrance worthy of a superhero at the 2012 MTV Movie Awards. Emma Stone explains to Andrew Garfield what it takes to be nominated for Breakthrough Performance at the 2012 MTV Movie Awards. Andrew Garfield lets real life love Emma Stone take the lead as they present Breakthrough Performance at the 2012 MTV Movie Awards. Ezra Miller, Emma Watson and Logan Lerman debut the world premiere of the trailer for their film 'The Perks Of Being A Wallflower' at the 2012 MTV Movie Awards. Mila Kunis and Mark Wahlberg, co-stars of the comedy 'Ted,' present the nominees for Best On-Screen Dirtbag at the 2012 MTV Movie Awards. Mila Kunis and Mark Wahlberg present the first award of the night - a new category in the lineup! - for Best On-Screen Dirtbag at the 2012 MTV Movie Awards. Jennifer Aniston raises the roof as she accepts the award for Best On-Screen Dirtbag at the 2012 MTV Movie Awards. Jennifer Aniston says that she has been searching for a script that allows her inner dirtbag to come out. Her man-eater role in 'Horrible Bosses' wins her Best On-Screen Dirtbag at the 2012 MTV Movie Awards. 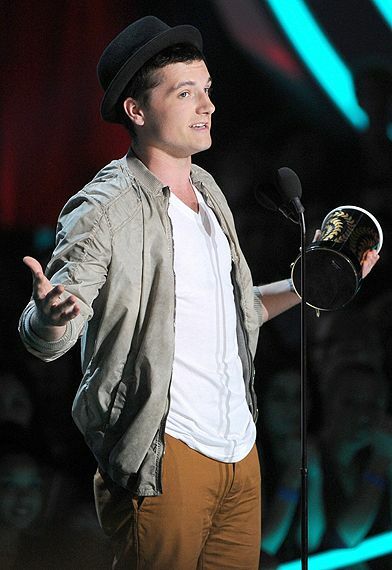 Josh Hutcherson says he's wanted a Golden Popcorn since he was 4 years old as he accepts the award for Best Male Performance at the 2012 MTV Movie Awards. 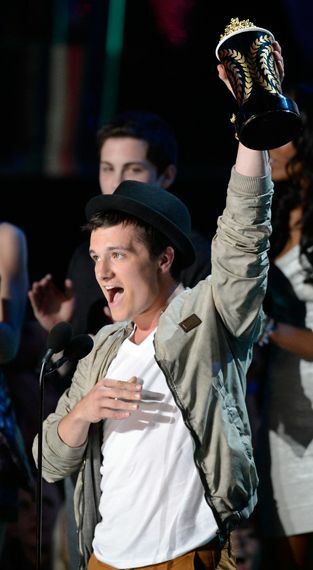 Josh Hutcherson thanks the cast, crew, and 'Hunger Games' creator Suzanne Collins as he accepts the award for Best Male Performance at the 2012 MTV Movie Awards. 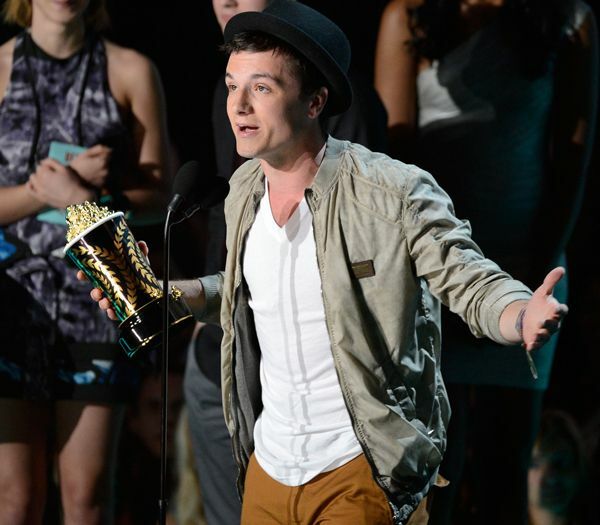 Josh Hutcherson is sweetly surprised to win Best Male Performance for his role as Peeta Mellark in 'The Hunger Games' at the 2012 MTV Movie Awards. Kristen Stewart and Chris Hemsworth present the award for Best Female Performance at the 2012 MTV Movie Awards. Kristen Stewart insists her 'Snow White and the Huntsman' co-star Chris Hemsworth is very in touch with his feminine side as they present Best Female Performance at the 2012 MTV Movie Awards. 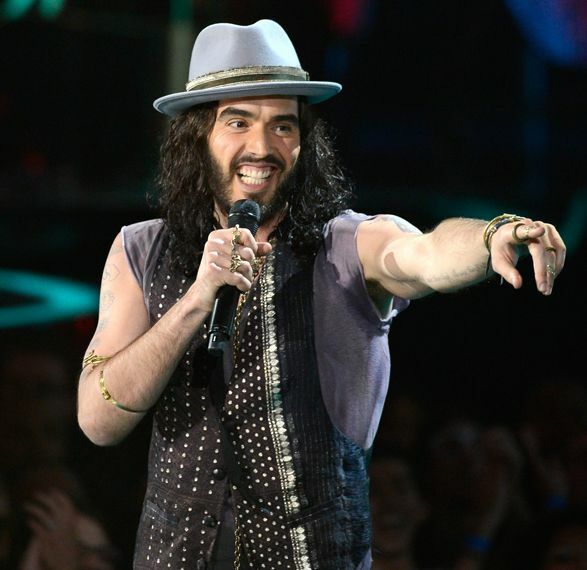 Our host with the most, Russell Brand, keeps the audience guessing by cheering, 'Hunger Games! Twilight! Hunger Games! Twilight!' Hey - what about Harry Potter? Shailene Woodley thanks the state of Hawaii as she accepts the award for Breakthrough Performance at the 2012 MTV Movie Awards. Wiz Khalifia lets the party get wild during his performance at the 2012 MTV Movie Awards. Andy Samberg, Leighton Meester and Adam Sandler, stars of 'That's My Boy,' hold tight to each other as they present the award for Best Kiss at the 2012 MTV Movie Awards. Andy Samberg jokes around with Leighton Meester and Adam Sandler as they present Best Kiss at the 2012 MTV Movie Awards. Kristen Stewart accepts the award for Best Kiss sans Robert Pattinson and asks, "Can anyone else help me out?" at the 2012 MTV Movie Awards. Kristen Stewart searches for an RPatz replacement by calling on her friends: "Chris? Charlize? Taylor? Someone help a girl out!" 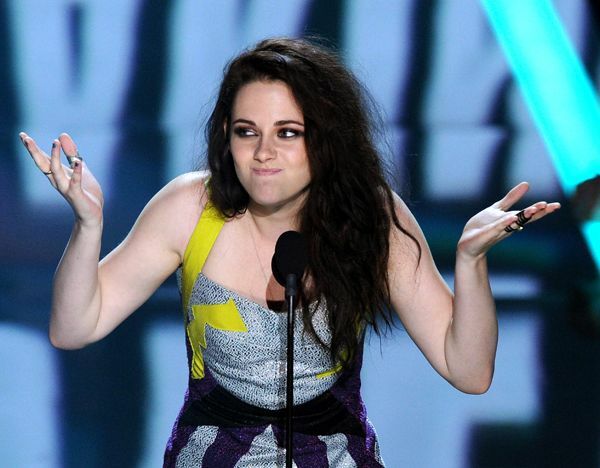 Stuck without a partner, Kristen Stewart demonstates self-love as she accepts the award for Best Kiss at the 2012 MTV Movie Awards. Kristen Stewart makes out with herself as she accepts the award for Best Kiss at the 2012 MTV Movie Awards. Jessica Biel and Kate Beckinsale look like twins as they take the stage to present Best Cast at the 2012 MTV Movie Awards. Jessica Biel and Kate Beckinsale look on in their matching mini's as Emma Watson accepts the award for Best Cast on behalf of the 'Harry Potter' family at the 2012 MTV Movie Awards. Emma Watson accepts the award for Best Cast on behalf of the entire 'Harry Potter' family at the 2012 MTV Movie Awards. Charlize Theron ain't too happy with Michael Fassbender's diss about female presenters at the 2012 MTV Movie Awards. Charlize Theron and Michael Fassbender show us how it's done as they present the award for Best Fight at the 2012 MTV Movie Awards. Charlize Theron shows off her tough girl moves on Michael Fassbender as they present Best Fight at the 2012 MTV Movie Awards. Michael Fassbender cups an aching jaw after getting beat up by fellow presenter Charlize Theron at the 2012 MTV Movie Awards. Presenter Michael Fassbender gasps as Alexander Ludwig and Josh Hutcherson almost drop their award for Best Fight at the 2012 MTV Movie Awards. 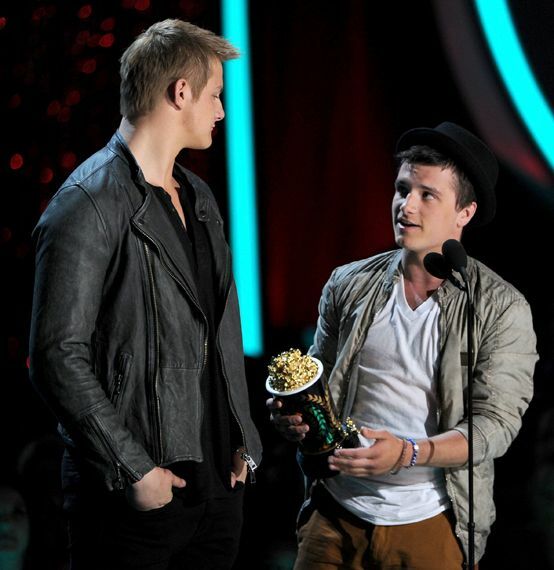 Alexander Ludwig and Josh Hutcherson share the Golden Popcorn for Best Fight at the 2012 MTV Movie Awards. Channing Tatum practices his 'Magic Mike' moves as co-star Matthew McConaughey looks on at the 2012 MTV Movie Awards. Joe Manganiello gets the crowd all fired up as his 'Magic Mike' character at the 2012 MTV Movie Awards. Joe Manganiello shows off his magic stick at the 2012 MTV Movie Awards. Matthew McCounaughey, Joe Manganiello and Channing Tatum, co-stars of 'Magic Mike,' joke around as they present Best On-Screen Transformation at the 2012 MTV Movie Awards. Elizabeth Banks lives every woman's dream as she accepts the award for Best On-Screen Transformation from the boys of 'Magic Mike' at the 2012 MTV Movie Awards. Joe Manganiello holds on to Best On-Screen Transformation winner Elizabeth Banks' Golden Popcorn as Matthew McCounaughey and Channing Tatum look on. Joe Manganiello sweeps Best On-Screen Transformation winner Elizabeth Banks off her feet at the 2012 MTV Movie Awards. Joe Manganiello helps Elizabeth Banks make a grand exit at the 2012 MTV Movie Awards. Emma Stone gives a teary and heartfelt thank you as she accepts the first ever Trailblazer Award at the 2012 MTV Movie Awards. Emma Stone thanks her personal role models for inspiring her to be original as she accepts the Trailblazer Award at the 2012 MTV Movie Awards. 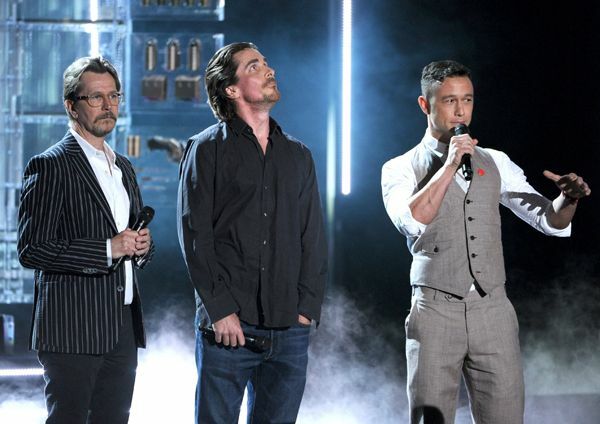 Gary Oldman, Christian Bale and Joseph Gordon-Levitt look dapper to debut an exclusive clip from 'The Dark Knight Rises' at the 2012 MTV Movie Awards. Gary Oldman, Christian Bale and Joseph Gordon-Levitt prepare to share an exlusive clip from 'The Dark Knight Rises' at the 2012 MTV Movie Awards. 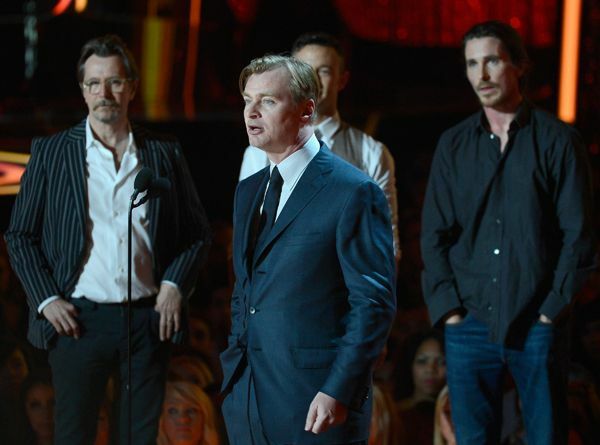 Director Christopher Nolan presents an exclusive clip from 'The Dark Knight Rises' as stars Gary Oldman, Joseph Gordon-Levitt and Christian Bale look on at the 2012 MTV Movie Awards. Christian Bale becomes emotional over a clip of 'Dark Knight' co-star Heath Ledger at the 2012 MTV Movie Awards. 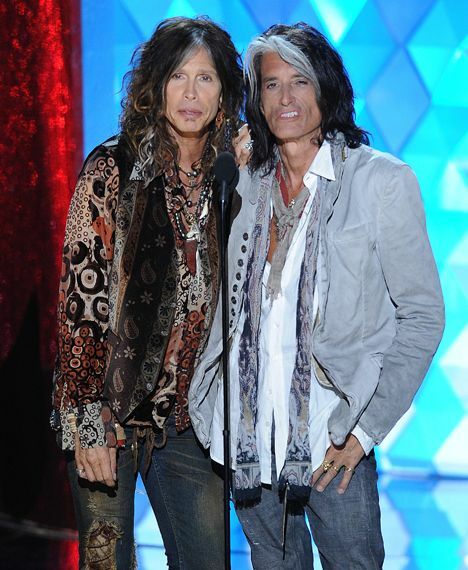 Steven Tyler and Joe Perry take the stage in matching ensembles to present the Generation Award to Johnny Depp at the 2012 MTV Movie Awards. 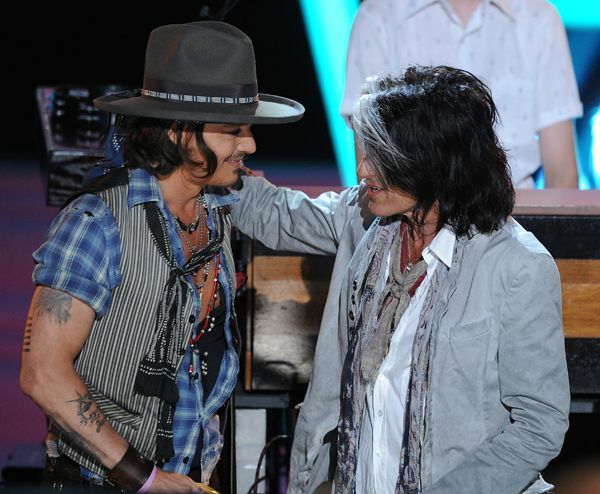 Aerosmith guitarist Joe Perry congratulates Johnny Depp on his Generation Award at the 2012 MTV Movie Awards. 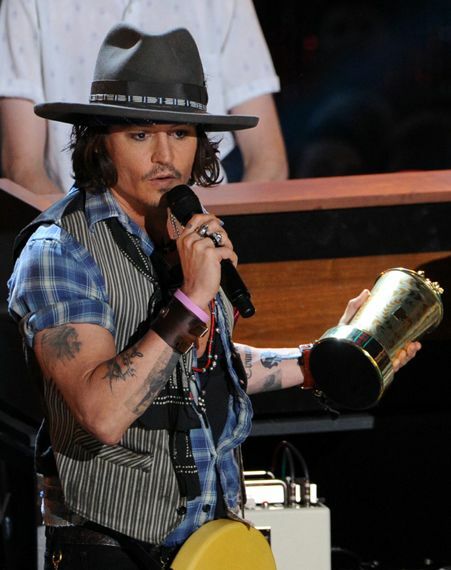 Johnny Depp accepts the Generation Award with his guitar on his hip at the 2012 MTV Movie Awards. Presenter Jodie Foster looks on as Kristen Stewart accepts the award for Movie of the Year for 'The Twilight Saga: Breaking Dawn - Part 1' at the 2012 MTV Movie Awards. Kristen Stewart looks star struck as her co-star Taylor Lautner thanks the fans for the award for Movie of the Year.